NCERT Solutions for Class 10 Science Chapter 12 Electricity are provided here with simple step-by-step explanations. These solutions for Electricity are extremely popular among class 10 students for Science Electricity Solutions come handy for quickly completing your homework and preparing for exams. All questions and answers from the NCERT Book of class 10 Science Chapter 12 are provided here for you for free. You will also love the ad-free experience on Meritnation’s NCERT Solutions. All NCERT Solutions for class 10 Science are prepared by experts and are 100% accurate. What does an electric circuit mean? An electric circuit consists of electric devices, switching devices, source of electricity, etc. that are connected by conducting wires. Define the unit of current. Calculate the number of electrons constituting one coulomb of charge. One electron possesses a charge of 1.6 × 10−19 C, i.e., 1.6 × 10−19 C of charge is contained in 1 electron. Therefore, electrons constitute one coulomb of charge. Name a device that helps to maintain a potential difference across a conductor. A source of electricity such as cell, battery, power supply, etc. helps to maintain a potential difference across a conductor. What is meant by saying that the potential difference between two points is 1 V? How much energy is given to each coulomb of charge passing through a 6 V battery? Therefore, 6 J of energy is given to each coulomb of charge passing through a battery of 6 V.
On what factors does the resistance of a conductor depend? Will current flow more easily through a thick wire or a thin wire of the same material, when connected to the same source? Why? Resistance is inversely proportional to the area of cross-section of the wire. Thicker the wire, lower is the resistance of the wire and vice-versa. Therefore, current can flow more easily through a thick wire than a thin wire. Let the resistance of an electrical component remains constant while the potential difference across the two ends of the component decreases to half of its former value. What change will occur in the current through it? The potential difference is reduced by half, keeping resistance constant. Let the new resistance be R' and the new amount of current be I '. Therefore, from Ohm’s law, we obtain the amount of new current. Why are coils of electric toasters and electric irons made of an alloy rather than a pure metal? (a) Which among iron and mercury is a better conductor? (b) Which material is the best conductor? Draw a schematic diagram of a circuit consisting of a battery of three cells of 2 V each, a 5 Ω resistor, an 8 Ω resistor, and a 12 Ω resistor, and a plug key, all connected in series. Three cells of potential 2 V, each connected in series, is equivalent to a battery of potential 2 V + 2 V + 2 V = 6V. The following circuit diagram shows three resistors of resistances 5 Ω, 8 Ω and 12 Ω respectively connected in series and a battery of potential 6 V.
Redraw the circuit of question 1, putting in an ammeter to measure the current through the resistors and a voltmeter to measure potential difference across the 12 Ω resistor. What would be the readings in the ammeter and the voltmeter? To measure the current flowing through the resistors, an ammeter should be connected in the circuit in series with the resistors. 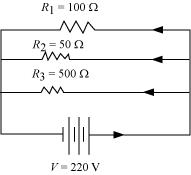 To measure the potential difference across the 12 Ω resistor, a voltmeter should be connected parallel to this resistor, as shown in the following figure. Judge the equivalent resistance when the following are connected in parallel − (a) 1 Ω and 106Ω, (b) 1 Ω and 103Ω and 106Ω. An electric lamp of 100 Ω, a toaster of resistance 50 Ω, and a water filter of resistance 500 Ω are connected in parallel to a 220 V source. What is the resistance of an electric iron connected to the same source that takes as much current as all three appliances, and what is the current through it? 7.04 A of current is drawn by all the three given appliances. Therefore, the resistance of the electric iron is and the current flowing through it is 7.04 A. What are the advantages of connecting electrical devices in parallel with the battery instead of connecting them in series? 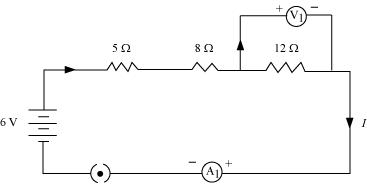 How can three resistors of resistances 2 Ω, 3 Ω and 6 Ω be connected to give a total resistance of (a) 4 Ω, (b) 1 Ω? Hence, the total resistance of the circuit is . The following circuit diagram shows the connection of the three resistors. Therefore, the total resistance of the circuit is . What is (a) the highest, (b) the lowest total resistance that can be secured by combinations of four coils of resistance 4 Ω, 8 Ω, 12 Ω, 24 Ω? There are four coils of resistances , , 12 Ω, and 24 Ω respectively. Why does the cord of an electric heater not glow while the heating element does? The heating element of an electric heater is a resistor. The amount of heat produced by it is proportional to its resistance. The resistance of the element of an electric heater is very high. As current flows through the heating element, it becomes too hot and glows red. On the other hand, the resistance of the cord is low. It does not become red when current flows through it. Compute the heat generated while transferring 96000 coulomb of charge in one hour through a potential difference of 50 V.
Therefore, the heat generated is . An electric iron of resistance 20 Ω takes a current of 5 A. Calculate the heat developed in 30 s.
Therefore, the amount of heat developed in the electric iron is . What determines the rate at which energy is delivered by a current? An electric motor takes 5 A from a 220 V line. Determine the power of the motor and the energy consumed in 2 h.
(d) Resistance of a piece of wire is proportional to its length. A piece of wire has a resistance R. The wire is cut into five equal parts. Therefore, the ratio is 25. Which of the following terms does not represent electrical power in a circuit? Power P cannot be expressed as IR2. Therefore, the power consumed will be 25 W.
Let, R be the resistance of the two wires. 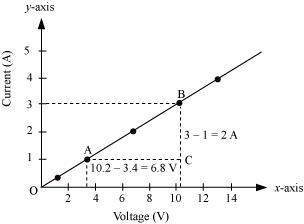 If V is the applied potential difference, then it is the voltage across the equivalent resistance. V is the applied potential difference across this RP. 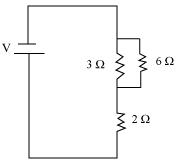 Note: H R also H i2 and H t. In this question, t is same for both the circuit. But the current through the equivalent resistance of both the circuit is different. We could have solved the question directly using H R if in case the current was also same. As we know the voltage and resistance of the circuits, we have calculated i in terms of voltage and resistance and used in the equation H = i2Rt to find the ratio. How is a voltmeter connected in the circuit to measure the potential difference between two points? A copper wire has diameter 0.5 mm and resistivity of 1.6 × 10−8 Ω m. What will be the length of this wire to make its resistance 10 Ω? How much does the resistance change if the diameter is doubled? Therefore, the resistance of the resistor is . When a 12 V battery is connected across an unknown resistor, there is a current of 2.5 mA in the circuit. Find the value of the resistance of the resistor. A battery of 9 V is connected in series with resistors of 0.2 Ω, 0.3 Ω, 0.4 Ω, 0.5 Ω and 12 Ω, respectively. How much current would flow through the 12 Ω resistor? R is the equivalent resistance of resistances . These are connected in series. Hence, the sum of the resistances will give the value of R.
How many 176 Ω resistors (in parallel) are required to carry 5 A on a 220 V line? Show how you would connect three resistors, each of resistance 6 Ω, so that the combination has a resistance of (i) 9 Ω, (ii) 4 Ω. Hence, we should either connect the two resistors in series or parallel. The third 6 Ω resistor is in series with 3 Ω. Hence, the equivalent resistance of the circuit is 6 Ω + 3 Ω = 9 Ω. Therefore, the total resistance is . Several electric bulbs designed to be used on a 220 V electric supply line, are rated 10 W. How many lamps can be connected in parallel with each other across the two wires of 220 V line if the maximum allowable current is 5 A? Therefore, 110 electric bulbs are connected in parallel. A hot plate of an electric oven connected to a 220 V line has two resistance coils A and B, each of 24 Ω resistances, which may be used separately, in series, or in parallel. What are the currents in the three cases? Compare the power used in the 2 Ω resistor in each of the following circuits: (i) a 6 V battery in series with 1 Ω and 2 Ω resistors, and (ii) a 4 V battery in parallel with 12 Ω and 2 Ω resistors. Two lamps, one rated 100 W at 220 V, and the other 60 W at 220 V, are connected in parallel to electric mains supply. What current is drawn from the line if the supply voltage is 220 V? Which uses more energy, a 250 W TV set in 1 hr, or a 1200 W toaster in 10 minutes? An electric heater of resistance 8 Ω draws 15 A from the service mains 2 hours. Calculate the rate at which heat is developed in the heater. (a) The melting point and resistivity of tungsten are very high. It does not burn readily at a high temperature. The electric lamps glow at very high temperatures. Hence, tungsten is mainly used as heating element of electric bulbs. (b) The conductors of electric heating devices such as bread toasters and electric irons are made of alloy because resistivity of an alloy is more than that of metals. It produces large amount of heat. (c) There is voltage division in series circuits. Each component of a series circuit receives a small voltage for a large supply voltage. As a result, the amount of current decreases and the device becomes hot. Hence, series arrangement is not used in domestic circuits. (e) Copper and aluminium wires have low resistivity. They are good conductors of electricity. Hence, they are usually employed for electricity transmission.